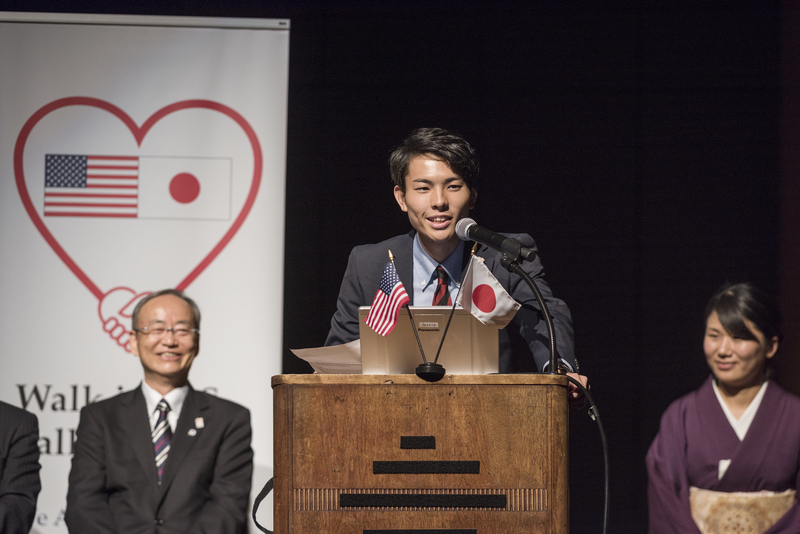 Chico State’s rich tradition of collaborating with international students, and Japanese students in particular, was on display on campus last month. 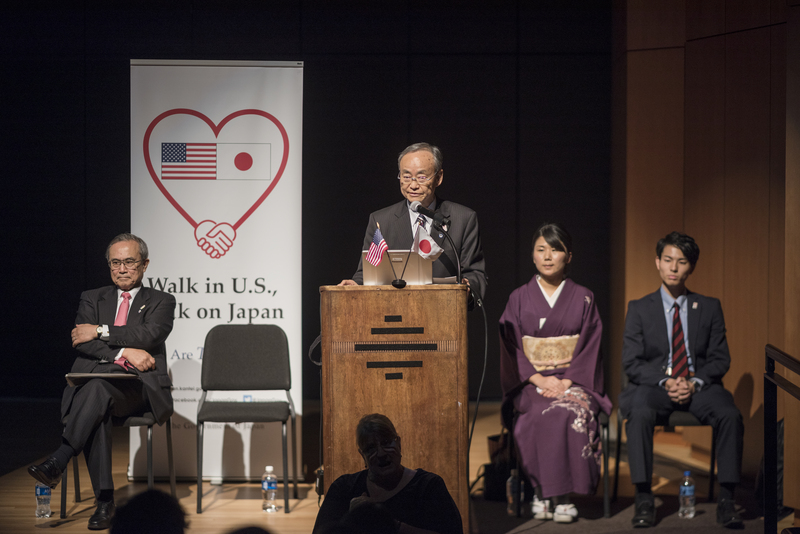 A delegation from the Office of the Prime Minister and Ministry of Foreign Affairs of Japan visited the University to lead a discussion titled “Walk in U.S., Talk on Japan,” held in the Zingg Recital Hall. Over seven days, the delegation visited five American colleges and universities in four cities across the country, finishing the tour at Chico State. 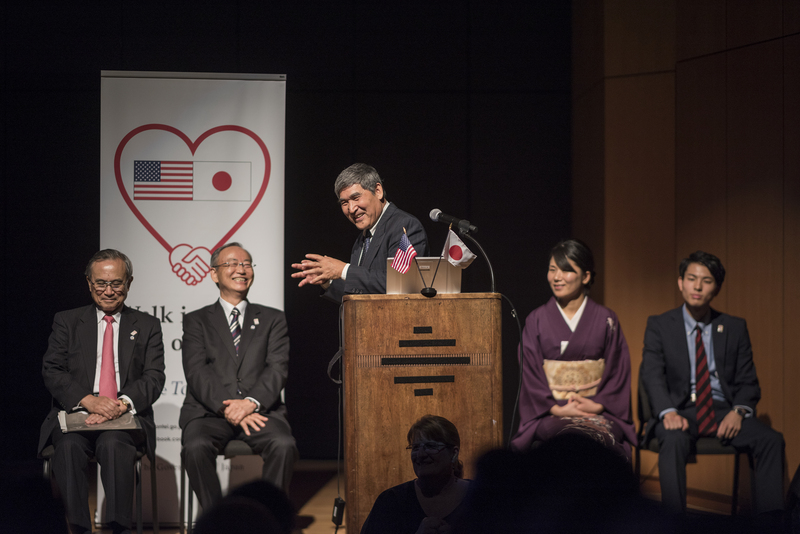 The goal of the visit was to increase awareness about Japan on a handful of issues and to continue to develop the Japan-US relationship through people-to-people diplomacy. 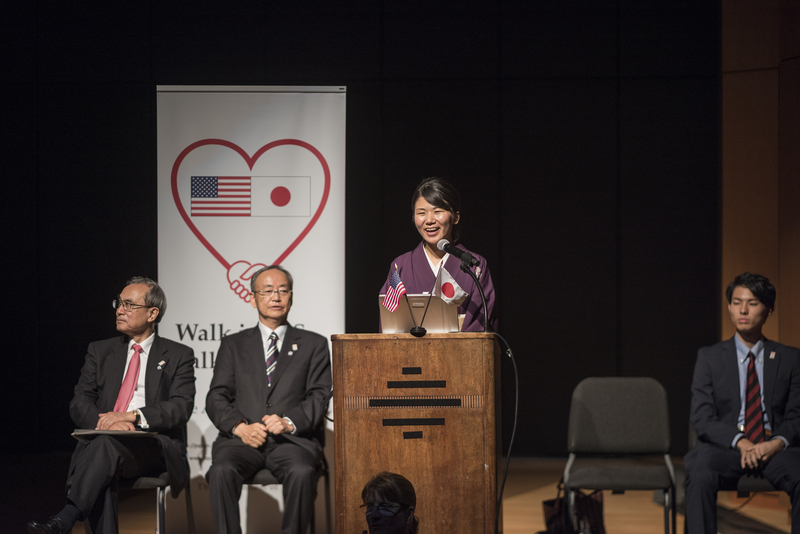 Central to the theme of the visit was discussion around Japan, its citizens, and its culture. 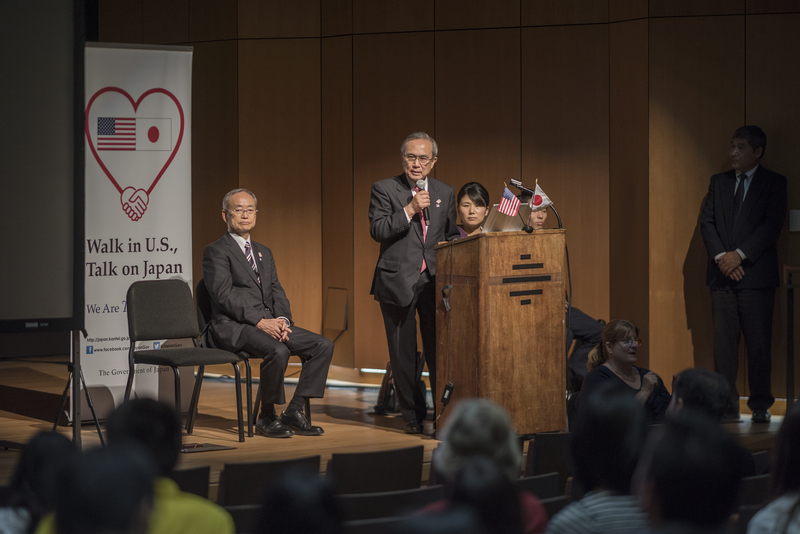 The well-attended event was free and open to the public, and was co-organized and sponsored by Chico State, the Consulate-General of Japan in San Francisco, and the Prime Minister’s Office of Japan. Leading the delegation was Ambassador Shotaro Oshima (center), chairman of the Institute for International Economic Studies and visiting professor at the National Graduate Institute for Policy Studies. 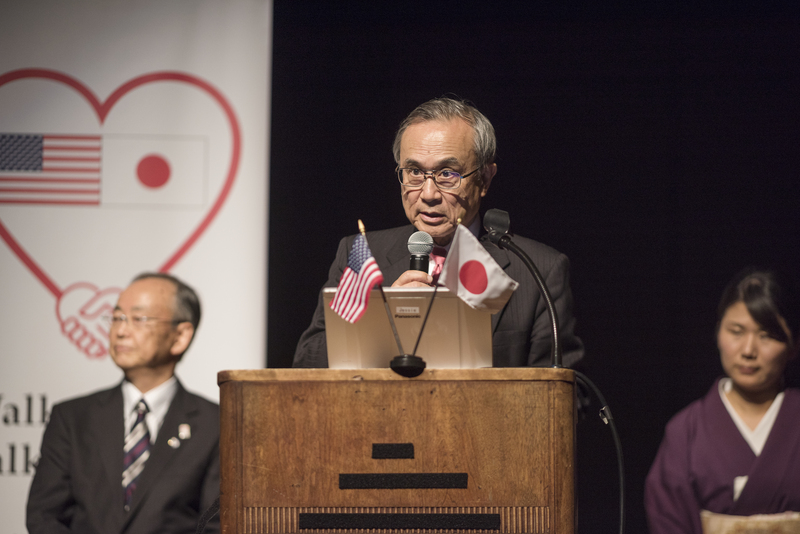 Accompanying Oshima was a delegation representing a wide range of Japanese cultural interests and backgrounds. Soushin Ikeda (at podium) is a master of Japan’s traditional tea ceremony, “chado.” Providing a fascinating history about the ceremony, including who takes part in it, how to properly prepare the special tea, and how each element in the ceremony is significant in its own unique way, Ikeda entertained the audience with rich descriptions interlaced with humorous remarks. Akio Ogasawara, a lecturer at Nihon University’s College of International Relations, discussed energizing Japan’s aging society. A spry man in his 70s, Ogasawara captivated the audience with his decades of wisdom, an easy smile, and an infectious laugh. His background includes helping to develop IBM’s ThinkPad, the first personal computer to head into space, and teaching. He explained he also remains vibrant and youthful thanks to playing a lot of ping-pong. Hokuto Suzuki (center), a student in the Graduate School of Sports Sciences at Waseda University, addressed the appeal of sports tourism in Japan. From its national sport of sumo wrestling and world-class surfing to its time-honored tradition of baseball, Suzuki emphasized that Japan’s rich sports culture is reason in itself to visit. And with the 2020 Summer Olympic and Paralympic Games to be held in Tokyo, Suzuki addressed how Japan will utilize the sharing economy (Uber, Airbnb, etc.) to accommodate the tremendous influx of visitors during the two-week event. Hosting visiting groups and delegations from overseas is part of Chico State’s overall effort to internationalize the campus and local communities, said Frank Li, interim vice president of Chico State’s Office of International Education. He also emphasized that hosting international visitors can bring as much value to the University community as it does for the campus guests. After the presentations by the three delegates, Oshima and the rest of the delegation answered questions from the audience. Topics included athletics in Japan, how often men take part in traditional tea ceremonies, what Japan is doing about the current refugee crisis, and the country’s position on North Korea as a possible nuclear threat. 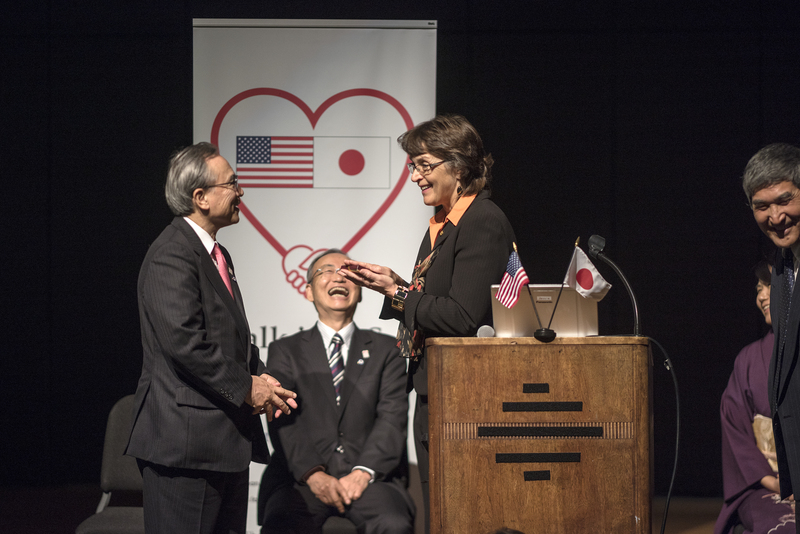 Chico State President Gayle E. Hutchinson provided the final remarks, commenting about the delegates’ visit, the University’s close relationship with Japan, and what the future holds for the University and its international visitors. President Hutchinson then exchanged gifts with the guests to complete the presentation.